**Compound essential oil /** Each of the unilateral essential oils has its effect. In order to achieve a specific purpose, the unilateral essential oils are combined in proportion, and the compound oil is prepared by mixing two or more kinds of unilateral pure essential oils according to the ratio. 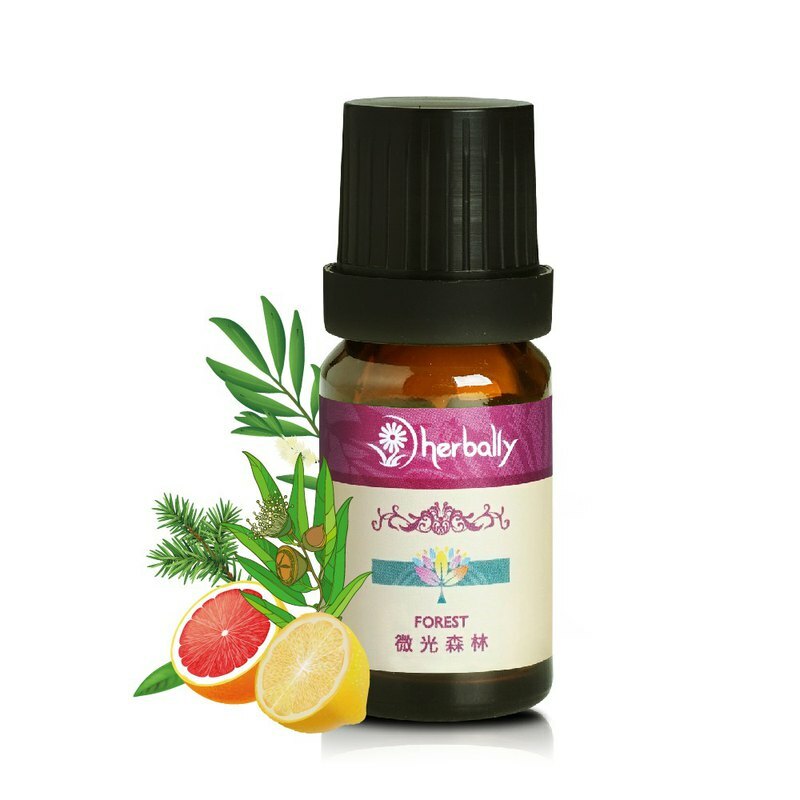 **Shimmering Forest /** ◆English name - Forest ◆Combination ingredients - lemon, grapefruit, tea tree, eucalyptus, Atlantic cedar ◆Taste description - refreshing grassy smell with a little stimulating aroma **Shimmering Forest Essential Oil Effect /** ◆Used to spread the fragrance to purify the air, soothe the spirit, refresh the mind, improve the tiredness, and have the effect of stimulating the emotions, which can alleviate the stress and improve the depression, improve the air odor, inhibit the bacteria, and purify the air to clear the mind. ◆ Improve oily skin Keep clean, condition skin and help oily skin stay clean. It has an antibacterial effect and helps to improve the immune system against infectious diseases. ◆ Relax tight nerves, relieve stress, and help to contemplate meditation. https://diz36nn4q02zr.cloudfront.net/webapi/images/r/SalePageDesc/3369629/image1.jpg?ts=130224 **Mode of use /** ◆Aromatherapy ◆ Bathing relaxation ◆With massage base oil ◆Cold/hot compress ◆Use handmade soap **storage method/** Be sure to use a dark glass bottle, and lock the bottle mouth at 25 ° C ambient temperature, avoid storing the essential oil in a humid environment or direct exposure to the sun to avoid deterioration of the essential oil (the essential oil does not need to be stored in the refrigerator). **It is recommended not to use objects /** ◆Children/Pregnant women/Breastfeeding ◆Broad bean disease ◆Low/hypertensive patients ◆Epilepsy patients ◆Sensitive groups **Precautions/** ◆ Essential oils should not be taken orally for external use. ◆ Do not use high doses and use them frequently. ◆ Please place it in a place where young children are not easy to take. ◆Physically sensitive, perform sensitive tests before use. ◆ Do not touch essential oils on the eyes, inner ear and mucous membranes. ◆The volatility of essential oils is high, please tighten the cap after use. ◆ Do not mix different brand essential oils to ensure the effect of essential oils. ◆The aroma conditioning method is recommended to be used by a professional aromatherapist. ◆ Essential oils are recommended not to use excessive amounts to avoid causing adverse effects and even causing excessive burden on the body. ◆Asthma patients are advised not to use steam inhalation method, please use it for nursed back to health. ◆ Essential oils are susceptible to light and heat, so put the essential oil in a blackout bottle and keep it in a cool place. ◆ Avoid diluting essential oils with plastic, soluble or oil-colored surfaces. Use glass, stainless steel or ceramics to dilute. ◆ Do not use broad bean disease, low/high blood pressure, epilepsy patients, pregnant women, and infants. If you need to use, please refer to relevant information or consult a professional doctor. ◆The above information provides reference for general oil users. The company's products do not involve any medical behavior. Aromatherapy is a natural treatment and cannot be regarded as orthodox medicine. If you have any discomfort, you should seek legal professional treatment to avoid the best time to delay medical treatment.